Shortly after I started running, I read an article about an amazing athlete named Joan Benoit (Samuelson). Joanie became my running hero. I read everything I could about her and her running endeavors including her Boston Marathon win. I said ‘read’ because that was my only option…to read magazines or newspaper clippings; it was only 1975 after all! In fact, this was during the first running boom when a marathon was on your bucket list only if you could run in under three hours! For me back then, not a far off dream. I was somewhat confident about my running dreams, self-assured and coached by none other than Jon Hughes…local running legend. Okay, ok, stop laughing…this is all true! Success was a “definite” for those coached by Jon. He was and is soft spoken but determined, competitive, faithful and truly believes the glass is “more” than half full. When I graduated from UF in 1983, I married this guy. 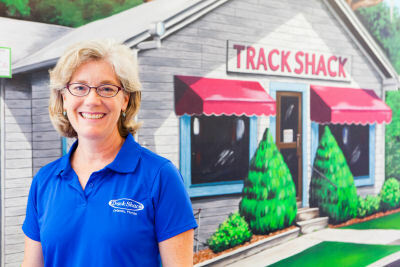 Although we didn’t have much, we did have a place to live, a car, a bike, a love of running and a 1/3 ownership in a struggling running specialty store called Track Shack. Before computers, before DVD’s, even before phones (other than those attached to your wall,) there was running. 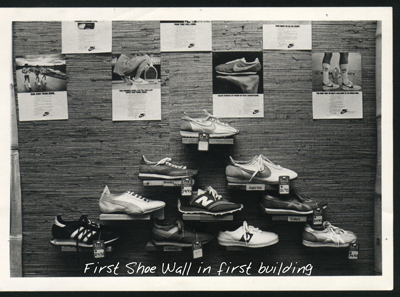 And of course we sold running shoes at our small store called Track Shack; there weren’t many choices, but even those shoes helped us get through those long runs. There was the Orlando Runners Club even back then and runners/friends like Brenda Dayton and Judy Greer. I remember when Brenda ran Space Coast Marathon and her electrolyte of choice was flat Coca-Cola. She, like so many of us thought we were invincible, just like Jon and I did when considering the future of Track Shack. Of course we would succeed, why not? Long hours, long runs…we would survive. Back in the seventies, we used vegetable oil instead of olive oil! We ate milk chocolate instead of dark chocolate! And who knew avocados were so good for you? 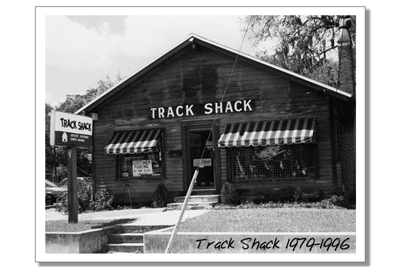 So many things have changed and happened in the world since Track Shack opened its door in 1977. That original shoe wall has expanded from 10 to 130 styles! I remember the day we watched the OJ Simpson chase on the TV behind the cash register. Jon and Donnie (he’s worked with us since 1978!) helped train Julie Isphording for the first woman’s Olympic Marathon in 1984. Julie raced with my hero Joanie who won that inaugural event in LA. The millennium came and went. We all figured out how to say 20 something and then the horribleness of 9/11 happened. My nephew was there and saw the devastation first hand. We watched the news and said, “We will rise above this,” and we ran and are still running. Shortly after watching Jon finish Boston in 2013, life for all runners changed. We went back the next year and we’ll be back again and again. Runners persevere, we are confident, we are self-assured and we are faithful. Our Track Shack extended family first included Natalie, Tom and Donnie. Soon after our own family came along. 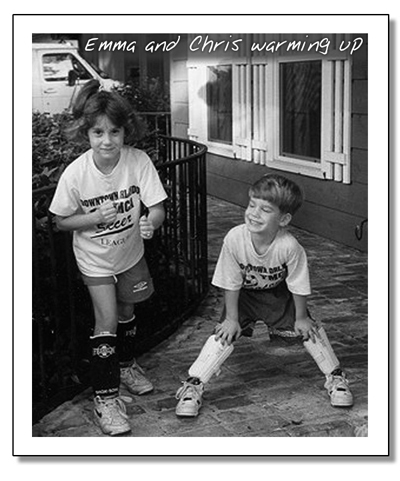 Emma was born in 1986 and we ran miles and miles together in one of the first baby joggers in Orlando. Now she and her husband Will, push our granddaughter Talia in a more modern jogging stroller. Our son, Chris who used to toddle around the store in a diaper eating Power Bars, is now managing our retail operation. 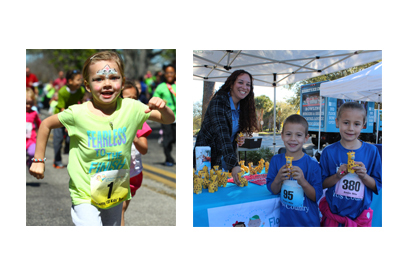 It is because of them, the rest of our team and our loyal customers, we not only survived, we are celebrating over 40 years of keeping Central Florida healthy and fit.